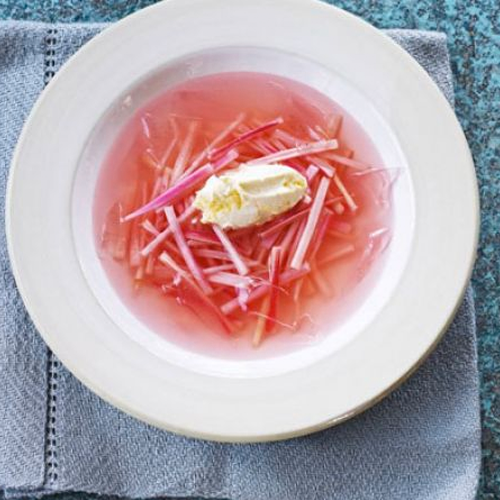 This is a great way to cook rhubarb so that it retains structure and bite – plus it’s a unique fruit jelly to serve up at a dinner party or any dinner for that matter! It is a dessert but also double as a funky starter, give it a go you won’t be disappointed! Very neatly cut the rhubarb into 5cm lengths, then cut each length into neat batons, about the size of thick matchsticks, and set aside. Tip the sugar, vanilla pod and seeds, wine and lemon zest into a wide pan and pour over 800ml cold water. Give everything a good stir to dissolve the sugar slightly, then set over a medium heat and gradually bring to boil, stirring occasionally. Turn up the heat to high so the syrup is boiling really fast, then turn off the heat and immediately stir in the rhubarb. Cover the pan with a plate or lid and leave to cool completely, then pour off 350ml of the syrup and reserve. Chill the remaining rhubarb and syrup. Soak the gelatine in cold water. Heat the reserved syrup in a small pan, then turn off the heat. Gently lift out the gelatine, give it a squeeze, then add it to the pan to dissolve in the syrup. Pour into 6 serving bowls, then put in the fridge and leave to set overnight. To serve, gently break up the jelly a little in each bowl, give the rhubarb a good stir, then use a slotted spoon to spoon an even layer of rhubarb into each bowl. Pour over some of the syrup and place a spoonful of clotted cream in the middle of each bowl to serve. Kimchi or Kimchee is a Korean pickled side dish made of cabbage and spices. A flavourful condiment to many dishes, it’s is also a natural probiotic, helping to promote a healthy digestive system. 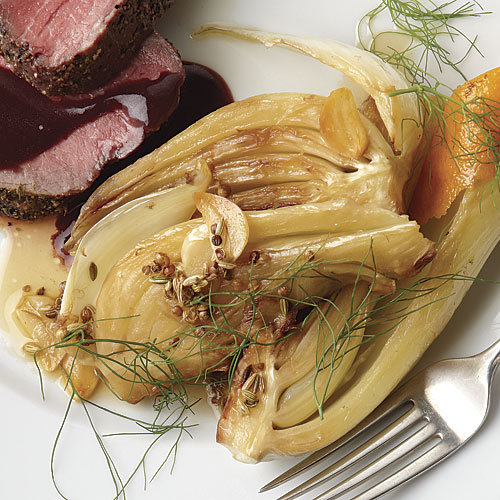 This quick version skips the lengthy fermentation process but delivers on flavour! The list of ingredients may be long, but it is mostly spices and flavourings. It is so simple to make, and so delicious. No need to live near a food truck hot spot, you can create that trendy food truck fusion in your own kitchen! 1. In a small bowl combing the soy sauce, brown sugar, sesame oil, garlic, red pepper flakes, ginger, oyster sauce and sesame seeds. Stir to combine. Slice the meat into thin strips, being sure to slice against the grain of the meat. Put the meat into the marinade and refrigerate at least 1 hour, preferably overnight. 2. Make the slaw by combining all ingredients in a large tupperware or bowl with a lid. Give it a good shake to make sure everything is well combined. Refrigerate for at least an hour before serving. 3. Stir the sriracha into the sour cream. 4. Cook the meat just before serving. Heat a skillet over high heat until it is piping hot. Pour the meat and marinade into the hot pan and cook, stirring things around constantly until all the meat is cooked. This will only take 3-5 minutes. If you want to be more authentic then cook it on an outdoor grill. 5. 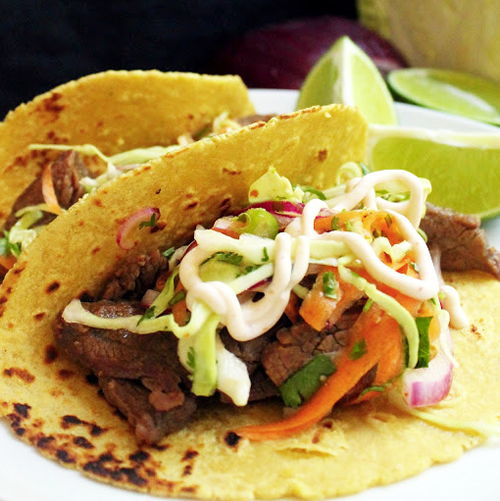 Serve by placing meat onto a warmed corn tortilla, topping with a strained, heaping spoonful of the kimchi slaw, and a dash of the sriracha sour cream. Garnish with a little coriander. Combine all of the ingredients for the tahini lemon sauce in a bowl and whisk together. Set aside. Grate the sweet potato and the apple into a large mixing bowl. Squeeze as much liquid out of the grated sweet potato and apple as possible and transfer the squeezed mixture into a clean bowl. Add the onion, salt, arrowroot, spelt flour, olive oil, turmeric, and pepper. Mix to combine. Heat a cast iron pan (or other skillet) over medium - high heat. Add apprx. 2 tbsp olive oil. 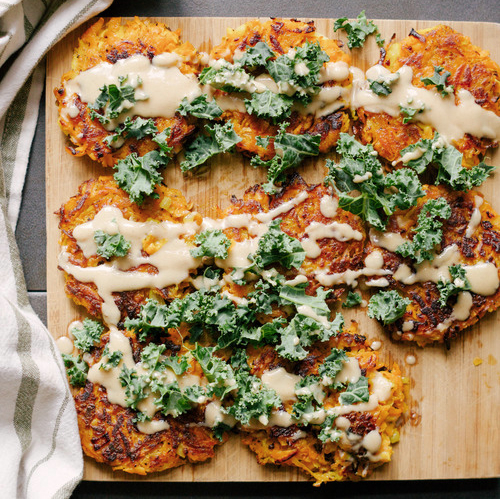 When the pan is hot take a handful (about 1/4 cup) of the latke batter and squeeze it together into a flatish round patty. Place it on the hot pan and press down on it with a spatula. Cook for 2 - 4 minutes per side until golden brown and crispy. Transfer to a plate or wire rack covered in paper towel to cool. Repeat until all of the latkes are cooked (you can place the cooked ones in the oven at 80c to keep them warm while cooking). Serve hot with plenty of sauce!